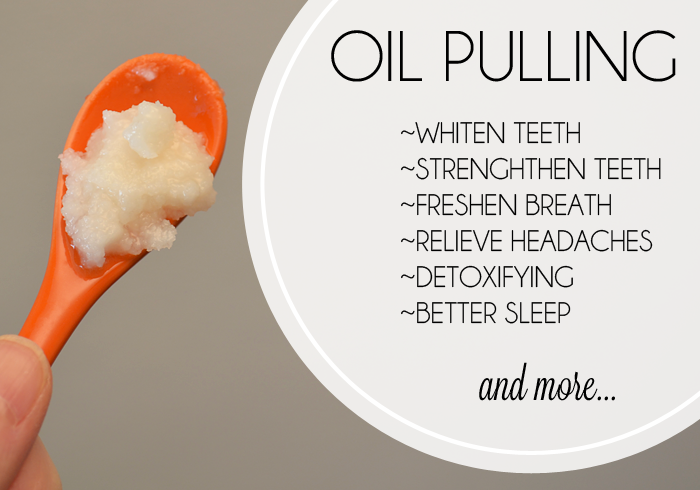 Oil Pulling..Yep, I'm doing it! Let me start by saying...I don't have a dog in this hunt. I'm not selling anything. It makes no difference to me if you try oil pulling or not. I tried it. LOVE! I am by no means a hippie. I hate the smell of patchouli. If you had told me a month ago that I would be oil pulling, I would have told you you were cray cray. Yet, here I am...pulling oil through my teeth as I type this. I read about it on Facebook, I had coconut oil in my cupboard...whitens teeth...I'm in! -I take about a third of a teaspoon of coconut oil and put it in my mouth. -Then, I swish it around for 20 minutes. -After 20 min, spit it out in the garbage. Do not spit in your sink, it will clog your pipes. Is it gross swishing oil in my mouth? Nope. Doesn't bother me one bit. Does this replace teeth brushing? Nope. I still brush my teeth every morning and night. Does it help with bad breath? Yep. I find your breath is just neutral. Not minty, just makes your mouth feel clean. I have been using Spectrum Naturals, Organic Coconut Oil, refined. I've read that unrefined is better, it has to do with the amount of Lauric Acid. Once this jar is done, I am going to try unrefined...I'll keep you posted on that. Straight up, I have no idea if the health benefits are true. I didn't have headaches before, so I don't know if it helps with that. i use the spectrum naturals organic refined as well, but i also have a jar of Dr. Bronner's organic unrefined, and i like that one better. it tastes better and has a more buttery texture, if that makes any sense. the hard part for me was NOT spitting it out into the sink or in the shower, but into the garbage...go figure! I'm going to try the unrefined. The buttery texture sold it!